Are you looking for the art and craft corner that may solve all the chaos in your enterprise about the banners and advertisement stuffs?? your design at par your expectations. We have all types of facilities like designing a batch for your employees or designing the banner for your venture. We give all your demands wings to fly. 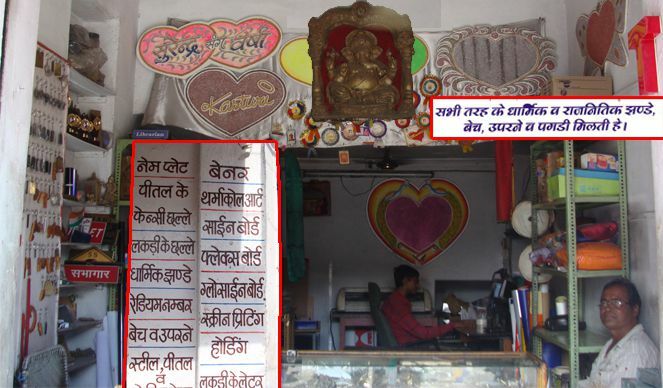 Our other services include kiosk, wall paintings of your ideology, fancy chhhalle, flex board glow sign boards. We also have all types of thermocol artwork, acrylic letters, radium number plates are also designed, bronze and steel letters, school, police name plates. We also have the privilege to design flags for any religious or political causes depending on the requirements and demands of the customers. Our rates are very optimized ones and our motto of service is to deliver work at par customer’s satisfaction. Give us a chance to explore ourself and feel our presence in the market place.